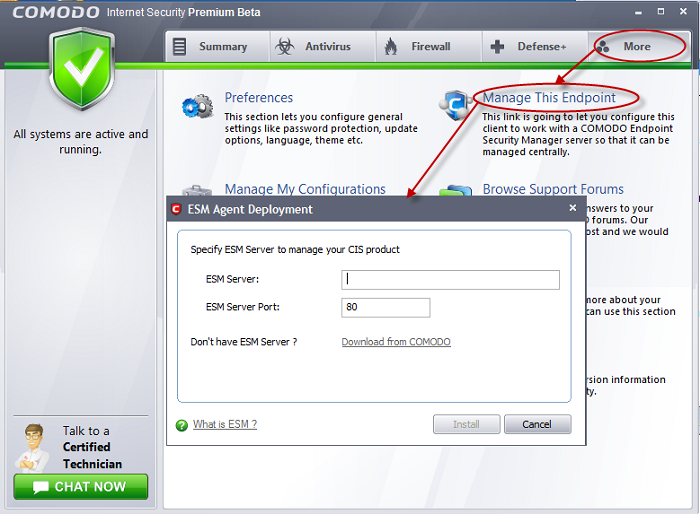 The ‘Manage this endpoint’ features allows administrators to connect Comodo Internet Security to Comodo Endpoint Security Manager (CESM) so that the endpoint (computer) can be remotely managed. CESM allows businesses to centrally manage CIS protected computers and provides a single interface for installation, updates and virus response across an entire network. It has an easy to use dashboard that provide fingertip access to common tasks and a wealth of statistics and reports that deliver a comprehensive snapshot of a network’s security levels. Using CESM to manage nodes protected with CIS will help administrators to greatly improve overall security, simplify administration, increase awareness levels, reduce virus response times and could save thousands of man-hours per year. 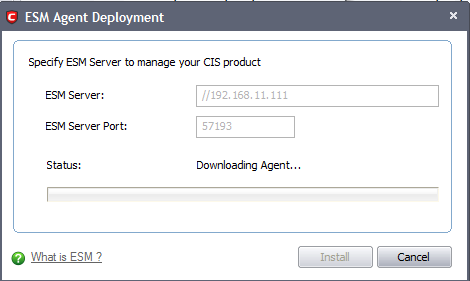 This wizard will install the CESM agent and allow admins to specify the IP/Port of the CESM server. If you are interested in CESM for your business, please click here. 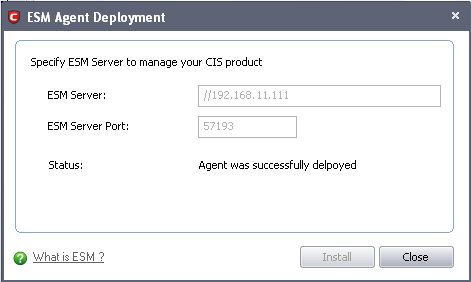 Enter the hostname / IP address of the server in which the CESM service is installed in the ESM Server field. See configuration tool for more details. Click 'Install' to begin installation of the agent. Once complete, you will be presented with a confirmation message in the 'Status' area. Click 'Close' to exit the wizard.